Slack Review: Does it outweigh Trello in Task Delegation? How to get your marketing team to collaborate better? Having the right integration for your marketing software can extend its functionality, eliminate duplicate work, and give you more insight into how your marketing campaigns are working. As an integral part of any marketing strategy, social media can help promote content, connect with customers, and engage employees. It’s this last bit that’s seen a big push lately, with companies pushing for social advocacy programs that encourage employees to share content within their own social media circles for better brand recognition and employee engagement. But before you invest in a social advocacy tool, you might consider using something like collaboration tool as Slack and Trello. Slack is a messaging app that brings all your communication together in one place. It offers real-time messaging, archiving and search for modern teams. You can have all your team communication in one place, instantly searchable, available wherever you go. Slack integrates with dozens of external services, and the app keeps adding more all the time. It offers built-in internal and external sharing options to ensure you can get and share files with anyone. The app has advanced search, filters and sorting that make it simple to get the right files. You can filter results by recent type, relevance or file type to find exactly what you need. Slack offers fully native apps for iOS and Android to give you full functionality wherever you go. Another feature is read state synchronization: when you read something on your phone, your laptop will know about it and automatically mark those messages as read. With Slack integrations available for many social media tools like HootSuite, you can share content directly with your teams, communities, and channels. Generally, Slack is a messaging platform for teams that brings all communication together, creating a single unified archive accessible through powerful search. Modern teams benefit from a unified communication hub that collates all channels they are using, but also stores their conversations in robust databases to make them easily searchable and available at any moment. Whatever action the user is performing with it, he will get to complete it on an intuitive and easy-to-use dashboard, even in cases where he has no experience with similar products. The lack of training and complex installations, the same as cloud hosting make Slack a reasonable investment, particularly having in mind its flexible pricing scheme. Slack is built around a channel format that allows you to quickly go from asynchronous to synchronous communication. When it matters, the real-time response cannot be undervalued, but Slack’s highly customizable notifications allow you to jump in and out when you’re needed. The centralized and searchable archive of messages is something that’s available not just to people on the team today, but the ones who start next week or next month or next year. Onboarding ramp up times are dramatically reduced. Other advanced features include creation of open communication channels, desktop and mobile messaging, internal and external sharing, flexible browsing, read-state synchronization, and many more. The numerous integrations give companies another distinctive reason to choose Slack for their needs. The system will blend easily in every software ecosystem, as it works with Zendesk, MailChimp, GitHub, Google Drive, Dropbox, and all main social networks. How I use Slack to keep an eye on all the content marketing activities? Slack is now a well-established social enterprise software, mainly known for its great user experience, chat capabilities, and apps but also for lots of integrations and additional apps that build on their platform. These apps and integrations make it possible to use Slack for many different things. You can keep track of your team’s progress on a project by connecting a to-do app, or you can connect to your cloud drive and work on files, and the latest is the possibility of making group calls within Slack. I’ve set up a Slack channel to specifically keep a log of my content marketing and social media activities. ⦁ Monitor when a blog gets published. ⦁ Monitor when comments on a blog are made. ⦁ Get notified when social media is published, like new Tweets or Facebook posts. ⦁ Receive newsletter subscribe/unsubscribe notes and send reports. ⦁ Monitor the uptime of websites. ⦁ Receive Web analytics, such as traffic reports and social sharing. ⦁ Monitor how my blog performs. All this can be configured in an hour with Slack integrations. Let’s take a look at how to get started. This is easy. Just write down a list of sites, tools, and apps you are currently using to publish or track content. This could be Twitter, Facebook, Google Analytics, Instagram, Hootsuite, WordPress Dashboard, etc. Think of all the content you publish, channels you own, and the duties that come with it. ⦁ Twitter activities for both my clients and my own channels. ⦁ Facebook posts from my clients and my own properties. ⦁ New WordPress posts and comments from 3 blogs. ⦁ New posts made on my Tumblr. ⦁ Uptime for different sites and blogs. ⦁ MailChimp data like subscribes and unsubscribes for different newsletters. Now, check the Slack integrations page to determine whether the tools and platforms you use are supported with integrations. If not, you can check IFTTT (If This Then That) or Zapier, two handy tools that allow you to quickly build your own integration for Slack. I did this for my Pinboard account, which I use to publish a Linkroll to my blog. All bookmarks tagged with #toshare are automatically shown on my blog, but I also want to make my team aware of each update on the blog, so I created a simple recipe on IFTTT. Right now if you search for Slack on IFTTT you get over 400 results. All major social web platforms are supported and if not you can try to build your own recipe in minutes. You just connect your Google account and then choose which analytics profile you want to query. You can quickly change the profile directly with a command inside Slack. This is especially useful when you have to provide some basic numbers on traffic during a meeting or a chat. To keep an eye on how each post on a blog performs you can use Google Analytics or one of the many apps available which support this task. I am using the Priceonomics content tracker web app. It’s really simple and free, and it does connect to Slack. It gives a quick overview of the most recent articles and their performance on social media (shares) and pageviews. Pushing updates from Instagram, Twitter, Facebook or your Tumblr blog to Slack is very easy. 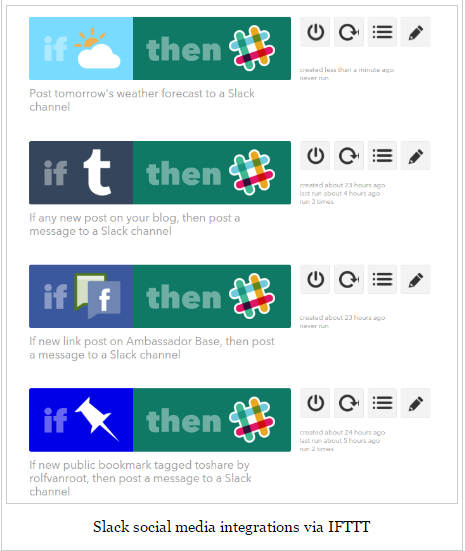 You can use IFTTT to push updates from your social profiles to your Slack channel. For Twitter, there is also a Slack integration. 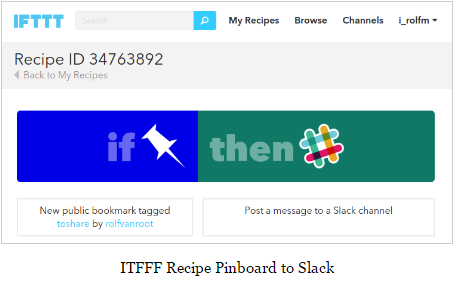 Check the many available recipes to connect to Slack from IFTTT. Trello is one of the leading project management apps currently available on the market. No. 1 spot in this category is held by Wrike which has a score of 9.8 and has won our Best Project Management Software Award for 2017. The concept of boards ( which correspond to projects) and within boards, there are cards (which represent tasks). The cards contain lists which can be used to track the progress of a project or to simply categorize things. Well-integrated and reasonably priced, Trello is currently one of the most attractive project management and collaboration system available on the market. As a project management and collaboration system, Trello enables members to discuss a project or a task in real-time. It keeps everybody informed through task assignments, activity log, and email notifications. Members can easily be added to a board where they are free to vote on ideas contained in the cards. Trello offers many important PM & collaboration benefits. First and foremost, Trello is easy to use. The card system contains all possible nuggets of information about a project. Drag and drop functionality is helpful and the interface allows in-line editing. The website is also accessible from any browser, whether mobile or web-based, smartphone or tablet. It keeps things organized when the cards can be placed in lists to track the progress of a project, assign categories, or just keeps things neat. Lists can be fully customized, and collaboration takes place in real time. Members get apprised of the latest developments in a project and changes made appear instantaneously onscreen. There are also instant notifications alert users when new tasks have been assigned or when updates and changes were made on the project. Trello is available as an app on iPhone and Android so it is easy to access even while mobile.The web version supports most browsers and can also be accessed whether one is using Apple or Android phones or tablets. A Trello board is a list of lists, filled with cards that can be used by you and your team. The software offers the tools you need to execute projects of any size. Open a card and you can add comments, create checklists, add labels and due dates, upload file attachments, and more. You can invite as many people as you need to your board for free. Simply drag and drop people to cards to assign tasks. Everyone sees the same board and the whole picture at once. Start a discussion with attachments and comments. Add a quick note or a detailed diatribe. Mention a member in a comment to make sure he/she gets notified. Add files by uploading them from your computer, OneDrive, Box, Google Drive, or Dropbox. Liven it up with emojis. Trello’s notification system instantly informs you whenever something important happens. You’ll get notifications inside the app, and via email, browser, and mobile push. Notifications stay in sync across all your devices. You can use checklists and due dates to keep track of important tasks, and upcoming dates, or items. The Calendar Power-Up offers a nice calendar view inside Trello. Or, you can use the iCal feed in your own calendar app. Trello works fast in real-time. When somebody moves a card, it instantly moves on your board, no matter what device you use. You can keep your tab open all day and never have to refresh. If you have a lot of boards and people in Trello, you can use teams to keep everyone connected. Teams are groups of people and boards, like your company, family, or roommates. You can create as many teams as you wish with your free account. You can create as many boards, cards, and teams as you wish and add as many people as needed. You can choose to make any number of teams or boards public or private. Trello offers apps for iPhone/iPad, Android phones, watches, tablets, and Kindle Fire tablets. It works on the internet at any screen size. You can find what you need with search, filtering, and labels. Search is fast and powerful, with sophisticated operators to help you narrow your search. Labels help you categorize your cards finely so you can find and filter them later. You can create cards and comments via email. Every board has a special email address you can use to create cards. Trello uploads the attachments you send along, too. Also, when you get notifications via email, you can reply via email without opening Trello. Trello keeps your data secure and private. You have full control over who sees your boards. All data is sent over a secure, SSL/HTTPS connection, the same encryption technology used by banks. The vendor keeps encrypted, off-site backups of your data in case of disasters. For extra bits of fun and functionality, you can opt for Trello Gold. It gives you extra stickers and board backgrounds, plus the ability to upload your own. You also get custom emoji and larger attachments uploads. Trello Business Class features include Power-Ups which connect Trello to services like Google Drive, Evernote, GitHub, and Salesforce, to name a few. You can get the ability to sort and filter boards, advanced security features, administrative controls, and all the benefits of Trello Gold. If you are looking to use Trello in your own app, extension, or plug-in, there’s a free, public Developer API for you. Depending on your purposes or interest, let’s choose a suitable interface and maximize your team efficiency. If you’ve been trying to improve your life with the help of ‘self-improvement information’ and have gotten little to no results, you’re not alone… Here are some of the top rated personal development courses available online.